Oh, for the Love of…Pop-its! | Oh, for the Love of Vintage! I know it has been ages since my last post, my humble apologizes. To answer some of the email queries: 1) I am alive 2) the blog is not going to be deleted and 3) I hope to resume more regular posting. I’ve been having trouble adjusting to some of ‘life’s circumstances’, but will try harder to make time for posting. I will respond to emails and comments just as soon as I can (I have limited net access). Now, let’s get down to brass tacks! 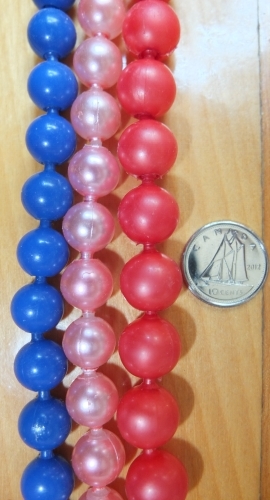 Pop-it beads started being produced in the early 50s as an inexpensive alternative to real pearls and other jewellery. This meant that all women, no matter their budget, could afford a higher-end look by buying the plastic alternative at the ‘Five and Dime’ Store. Pop-it beads were a huge fad in the 50s & 60s with girls, teenagers and women. I have been collecting and coveting Pop-it beads for many years now, as influenced by my mother. Everytime one of us gets a new strand, the other benefits by getting their fair share. Which reminds me, I need to mail my mom some of my latest acquistion! 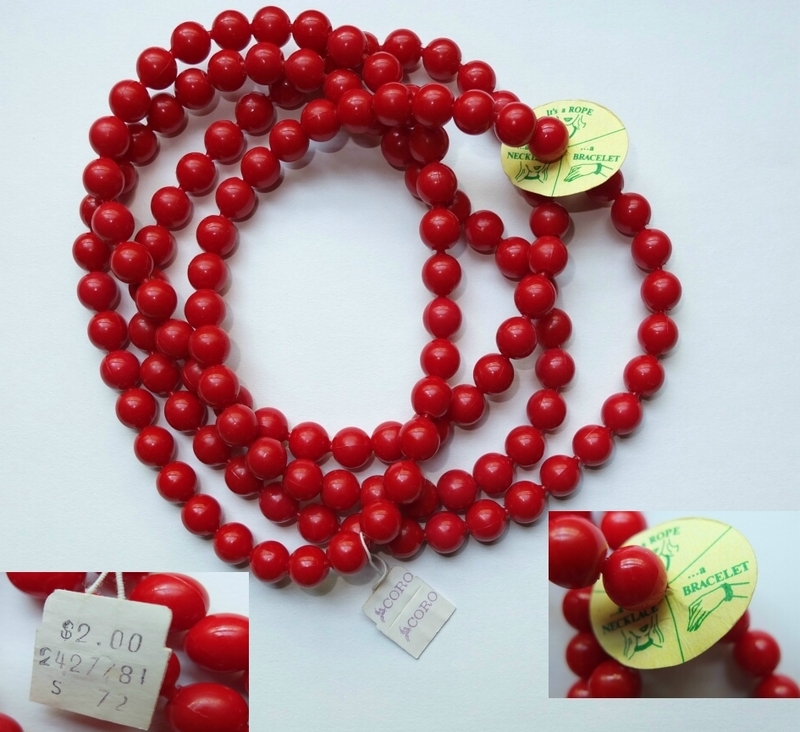 Not too long ago, I purchased the below ‘As-You-Like-It’ cherry red Pop-it beads from the great vintage costume jewellery manufacturer, Coro. They are, without a doubt, one of the most exquisite examples of Pop-its I have ever seen *swoons*. They still include their original Coro tag and price tag; they were originally sold for $2.00. 1950s Pop-it beads came in a variety of colours, sizes, shapes and styles. The beads were originally sold in very long strands, approximately 50-60 inches long. They were sold at this length so the customer could pop them apart to make a variety of necklaces, bracelets, etc. One could even wear them as a belt if they so desired! 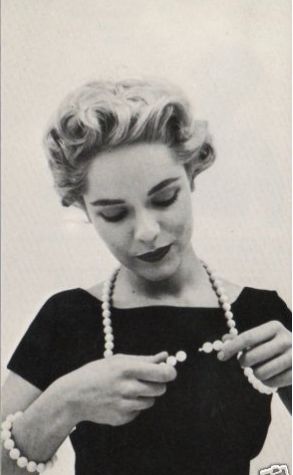 Women of the 50s bought Pop-it beads in droves. This was an extremely popular novelty with women buying many strands of varying colours and mixing and matching their pieces. Choker style Pop-it bead necklaces were also available and usually came with matching earrings. One could buy seperators and attachments for their strands to make their own chokers and unique styles. Pop-it beads came in a variety of colours: bright rainbow colours, pastel shades, gold & silver, autumn colours, etc. In the 50s, the rainbow colours were more popular with girls and the pastel and gold & silver shades more popular with grown women. The sheen on the beads was either pearlized, matte or shiny. The most popular variety with women was the white pearlized strands, which were fashioned to look like real pearls. These are also the most commonly found variety today. You often see these strands at yard sales and flea markets. Common Pop-it Bead Colours, Craigslist Ad $5 for All! The most common Pop-it bead shape is round, but other shapes were manufactured such as oval and barrel-shaped. I have a variety of shapes and sizes in my collection. It’s really fun to mix and match the shapes, sizes and colours for a truly unique vintage look! The round Pop-it beads came in a few different sizes. I’m not sure how to measure the different sizes accurately, so I’ll just provide an image to illustrate, with three different sized strands. The smallest size strands were more commonly worn by girls, with the medium and larger sizes worn by women. Several companies manufactured Pop-it beads in the 50s including Coro, Richelieu and companies in Hong Kong. Pop-it beads are still being manufactured today and are readily availiable at toy stores and online. Pop-it beads that were cheaply made in the 50s, haven’t stood the test of time. 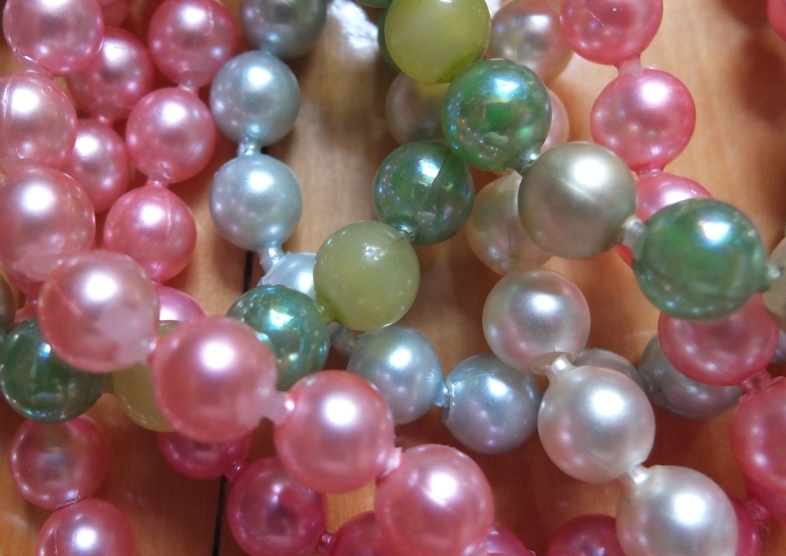 You will often come across a strand where the coating is flaking or the beads are sticky. However, don’t let that disuade you from buying them. You can always chip off the remaining coating and remove the stickiness. Pop-it beads are readily available and you can come across them at flea markets and yard sales. They are also available online at antique jewellery stores, Etsy and Ebay. 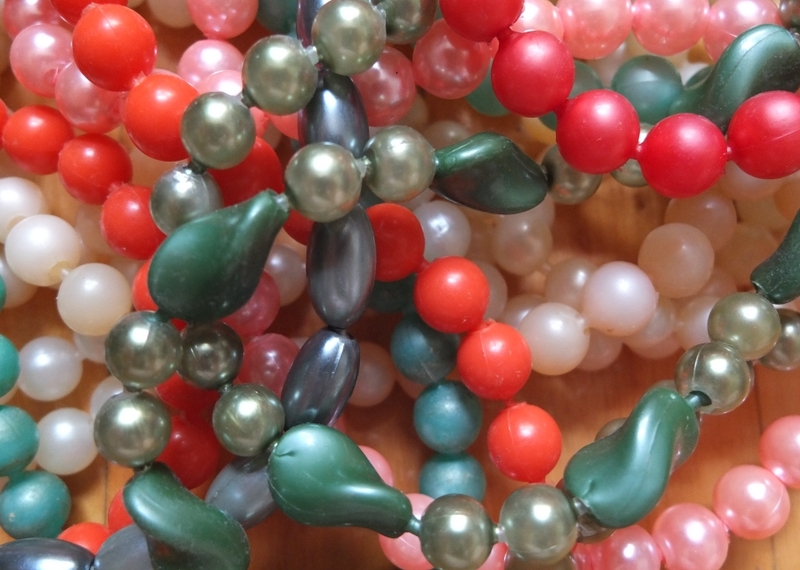 If you buy online, be careful as sellers can (and do) pass off 80s and present day Pop-it beads, as 50s strands. 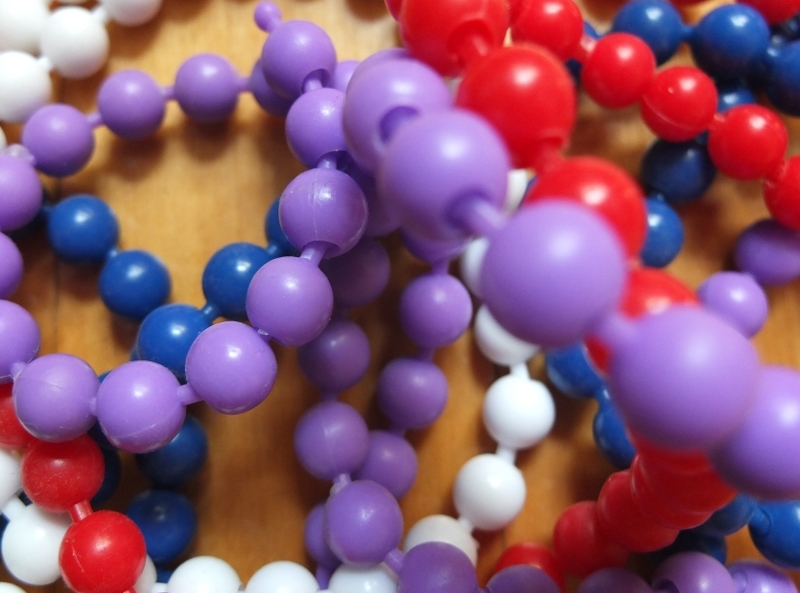 Prices for Pop-it beads range anywhere from $1 to $65, depending on the condition, colour and length. Pop-it bead sets that come with their original earrings appear to sell for higher prices. Do you have any Pop-it beads? What a thoroughly fantastic post! Jewelry and beading have always been near and dear to my heart too, and I’ve been keeping an eye out for Pop-Its while thrifting and the like for years, but no dice yet. I wonder if perhaps they were less common up here in Canada? Love the abundance of images you included here, now I have an even clearer/better idea of what to look for while rummaging through stacks of costume jewelry at yard sales and thrift stores. Hi hun! I’m sure you’ll come across some soon! They were very common here in Canada also. All of mine (except for one strand) come from yard sales and flea markets. Are you on the lookout for a particular colour? Let me know, as I often stumble across them. Wow! I’ve never even heard of these before. Fascinating. Thanks for sharing! Oh, I just love these! I remember when I was little you could get similar pop its out of the gumball machines at the grocery store. It was one of my favorite things! Thanks so much for sharing! I love how your posts are so informative, just fantastic! Keep up the good work! Enjoyed your informative post and all the yummy photos! I have a small collection of pop beads (compared to yours) … however, I just lucked upon a cache of 150 obviously vintage pop bead necklaces that an older collector consigned to a shop near me … woohoo!!! 😀 I bought quite a few to fill in colors missing from my own collection. Would love to see more pix of your pop beads!!! Thank you mysocalledcraftylife & cybersoots! I’m still collecting pop beads and have gotten some interesting ones as of late, will try and post some photos soon! Would love to see photos of yours as well. Sounds like a deal. I’ll take some photos of my new pop-its! Yes, I have pop-it-beads. I have been collecting them ,since I got married 45 yrs ago. My mother,rest her soul. Kept throwing mine in the trash. Nevertheless, I started collecting them in the sixties. Yard sales,is where I got my collection. They seem,hard to find now. Love my pop beads! Wearing some today. Now I have a drawer full but always on the lookout for more. Is there a website where I can order pearlized, white beads??? I love pop it beads~ And thank you for the great article! I have a problem and I am hoping so much you might be able to help me…. I have a crazy strand I have been trying to id for years. (okay, decades) They are double pronged. Not like the regular kind, these have 2 sets of little like anttenae on them allowing them to be connected. And, I have the matching earrings. I will happily send pictures, and would love any help, direction in trying to id the manufacturer and possible time when these were made/sold. Oh. yeah, they are so very orange. Not the screamy bright, but yeah, orange. Oohwala has become South East Asia’s most efficient growing company with beautiful gem stones and accessory goods. The business sincerely rooted to the “customer-first” ideals, Oohwala presents it’s customers anything and everything from common beads to valuable Swarovski gemstone available at competitive prices. Complemented with great support as well as seamless shopping experience, Oohwala is fully commited to delivering you top-quality products and services for an unequalled levels of services. Oohwala supplies special and beautiful jewellery and fashion accessories, that we all want will genuinely empower and connect buyers coming from more or less all around the town. Oohwala is a name associated with C. Rashiwala Bros. The physical outlet is proudly located at 100 Arab Street, Singapore. Oohwala is still South East Asia’s earliest and most highly regarded merchants involving Swarovski merchandise. Oohwala has never stropped attaining more goods for makers and craft fans alike; for both trend and interior design. The coming products and services will consist of but are not confined to BeCharmed and Pave, Jewelry producing equipment, 925 silver parts, tassels, fringes and trimmings. Oohwala is based in Singapore as well as deliver their items across the world. I have a strand from my childhood that I came across today and had totally forgotten I had them. My question is how to clean them. They are just a simple cream color, but they are sticky and yellowed. They all work beautifully still, which just proves how well they made items back in the day. I would like to give them to my daughter for her birthday, along with my mother’s 1956 navy and white polka dot shirt waist dress, straw white purse and navy velvet-veiled hat. Thank you for providing this info. Love your passion! I found autumn colored pop beads in my mother’s costume jewelry collection. They are beautiful and in excellent condition. Mother must have had them in the fifties/sixties. She would be102 years old this year. I can’t wait to wear them. I love pop heads too! I remember some from the early 60s that had a round “head” with a face and the arms and legs were the parts that connected to the other beads. Do you remember anything like this? I was given a strand of them by my mother when I graduated from 6th grade in 1968. I wish I still had them!! I had pop beads you can make little animals with, I think it was a book set called Chicken Socks? found it at a book store. I use a circle template and sliding caliper when I sort new beads. then a couple coats of water bade floor lacquer to protect the finish, works like a charm and highlights the color beautifully. I had a set in the late 80s that my mother bought me, I loved them as did she. They are l9ng gone. However, I’ve just purchased 326 pcs of pearlized pop beads for 5.50. Cannot wait to receive them. My granddaughter is but 16 months. I hope she will enjoy them too one day. Oh, I meant the late 70s. So sorry. « What’s in Your Vintage Summer Handbag?